Part 6 of 10 study lessons. For more info on the study lessons click here. I don’t want to get all “preachy” on you, but I will say this: Discipline is Biblical. As Fathers, we must discipline our children when they disobey us and more importantly when they sin against God. You are a derelict Father if you allow your children to remain in a constant state of rebellion against you and against God. If your children don’t obey you they will likely never obey their heavenly Father. In the same way our heavenly Father disciplines us, is the same way we MUST discipline our children. So, what does the Bible say about discipline? Quite a bit if you ask me. Now, I’m aware of the spanking debate. Pretty much all secular psychologists tell us that “spanking causes psychological damage” and I do believe that’s true to some extent. Unfortunately, too many parents don’t know the proper way of disciplining their children. Spanking, if done out of control can be labeled in some cases as child abuse. No doubt. But does this mean we completely disregard the idea of spanking? Absolutely not! The Bible speaks too much about it as you will see. But remember, this isn’t just all about spanking. It’s about discipline. Some discipline may include spankings, other discipline may not. Good luck trying to spank your 17 year old. Whether you have teenagers or toddlers Biblical Discipline is necessary when they disobey. And if you fail in this department, generations of your offspring will likely fail in this too. Remember, discipline is good. Discipline is meant to draw back that sinning child to reconciliation with their parents and repentance with their God. Biblical discipline will lead that child to a strong walk with their parents and God. Meditate on these verses and answer the questions below. Remember, this isn’t a thorough study on Biblical discipline, just a “warm-up” study. I encourage you to utilize the additional resources available (Books orSermons) on Biblical discipline. Also, spend a few moments and read some great quotes on Biblical discipline posted here. 1. What does God’s Word testify about every human being? Read: Jeremiah 17:9, Matthew 15:19, Romans 3:23, John 8:34, Isaiah 53:6. Are your children born innocent little angels? Read: Psalm 51:5, Psalm 58:3, Romans 5:12,19. From these verses can you see why your children need to be disciplined and ultimately saved? 2. What does the book of Proverbs say about discipline? Read: Proverbs 13:24, Proverbs 22:15, Proverbs 6:23, Proverbs 29:17. What did you learn from these verses? 3. What happens when discipline isn’t carried out? What did you learn from these verses? 4. 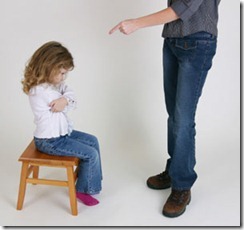 What warning does the Bible give when disciplining our children? Read: Ephesians 6:4. What did you learn from this verse? 5. Does our Heavenly Father discipline us? Read: Hebrews 12:9-11, Psalm 94:12, Deuteronomy 8:5, 1 Corinthians 11:32, Proverbs 3:11-12. What did you learn from these verses? Pray that God would open your eyes to the importance of Biblical discipline. That you would not provoke your children to wrath. But that you would train them up in the discipline and instruction of the Lord. Pray that you would be more Christ-like when you discipline your children. Read these short articles on Biblical discipline. 25 Ways to Provoke Your Children to Anger, How to Provoke Your Children and Parental Myth-busting Write a short paragraph about what you learned. Spend some time listening to some sermons on Biblical discipline. These sermons vary in length. You can find the sermons here. "Some discipline may include spankings, other discipline may not." I think that's one of the biggest problems in the debate, and what leads to some of the abusive spanking. I see too many people who thing spanking is the ONLY form of discipline, and who also go straight to publishing disobedience but neglect to train the child to obey first. My husband and I have chosen not to spank because of our family histories, and it has forced us to spend a lot of time on training and modeling the behavior we want instead of just reacting to misbehavior. We do discipline for willful disobedience, but I find myself doing it much less than many of my friends who spend more tie spanking than teaching/training.